Supposedly there were 50,000 people watching the Bray air show yesterday. That's what RTE says, that's what the Irish Independent says and I'm sure others are saying the same. Well, based on what I saw from the top of Bray head, in order for there to have been 50,000 people watching the show you'd have to count pretty much everyone who was in Bray at the time because I would doubt there were many more than 10-15,000 actually down at the sea front. There's been quite a bit in the Irish Times about atheism lately. John Waters' column on Friday and Shane Hegarty's on Saturday are only two examples. Anyway, it got me thinking back to something I saw when I was in Belgium. 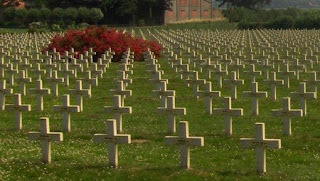 Most of the headstones in the WWI cemeteries have crosses on them. The Americans, French and Germans actually use a cross-shaped stone as the marker. Every so often in the American and German cemeteries I was in (back in '07) I came across a grave with a Star of David headstone. And, in the French cemeteries I saw some for their Muslim dead. But, how did they mark atheists' graves? I never came across anything that might have answered that question. The British used a rectangular-shaped stone with a rounded-off top rather than the cross-shaped stone. The British headstones have a cross (or Star of David) etched into the stone. 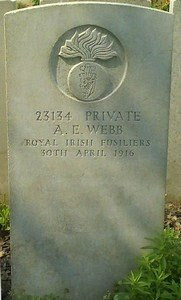 However, it was only in the British cemeteries that I came across stones marking what might have been atheists' graves. Obviously, I have no way of finding out for sure, but this grave of a soldier from the Royal Irish Fusiliers looks so bare that I just assumed he had made it known that he wanted no cross or any religious marker on his grave. And they say there are no atheists in foxholes. When I saw this Washington Post headline - "Video of Moonwalk From 1969 Restored" - I thought to myself, "Geez, haven't we seen enough of Michael Jackson already?" I bet I'm not the only one who'll have that reaction to that headline. I don't care about bullet-proof vests and all that. He can't throw. I was mortified watching him. I can't help thinking his wife would have done a better job. MORE: Okay, I found it on YouTube and it doesn't look as bad as I thought when I saw it on the television. He did go to the rubber, so points for that. Still, he looks very uncomfortable, which I hadn't anticipated. I can claim no expertise with regards to industrial relations, but surely one rule of thumb for a union is that you should not go on strike if it's even vaguely possible that your employer would be just as happy to close the operation where you work? Well, the employees at our (publicly funded & run) local recycling center went on strike about two months ago and there seems to be little appetite to reopen the place. I can imagine that the County Manger is enjoying the added "revenues" he's getting so long as the center is closed. And, seeing as (a) it's not really essential and (b) it was probably only used by 20% (or so) of the local people (and that estimate is probably high) the workers may have overestimated their power. The truth is I don't really know the ins and outs of the dispute. 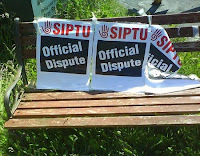 It's entirely possible that the workers are being so mistreated that a strike was the only option. I don't know, but the fact that I don't know and I was a fairly regular user of the center and even I've gotten over the center's closure shows how slight the workers' hold over their employer was. Something else that I was interested in is the nature of going on strike. In the picture I pasted above there is no human being near the center; yet that was the middle of a workday when the center should have been open. Shouldn't the workers have been picketing there? The strikers had left a few of their signs on a bench near the entrance and that was the only sign that the center wasn't simply closed down. That's not my impression of being on strike. I spent two days touring WWI sites last week and can't wait to go back. The fact that you can get to Charleroi for €8 round trip - everything included - may see me back there sooner rather than later. 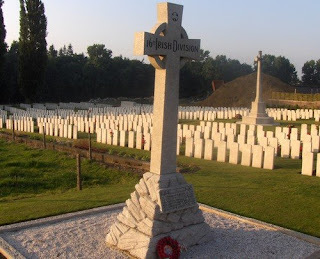 I wrote about some of what I saw/did over here, but basically we toured cemeteries and monuments around Ieper (Ypres), Bethune in France and Thiepval. The original plan was to stick to the area around Ieper, but when we got the information we needed to locate my wife's great-grandfather's plot in Bethune, we went there. The British cemeteries are a different experience to the American ones. The number of visitors is far, far greater. I guess that's to be expected given the distances involved, but still when I was at the American WWI cemetery near Chateu Thierry in 2007 we were the only people there during the entire time we were at the cemetery. This goes back to what Charles Krohn said about how few Americans visit the WWI cemeteries even though thousands go to Normandy. The British do a much, much better job of explaining what happened in the various locations. Now, maybe that's because WWI had a much bigger impact on Britain than it did on America. I don't know. But, you can learn what happened at the various battles near each cemetery and there are many. I mean many. 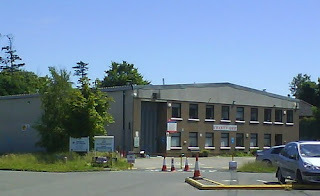 At some road junctions you might see half a dozen signs pointing in every direction. Next junction same again, but different cemeteries. 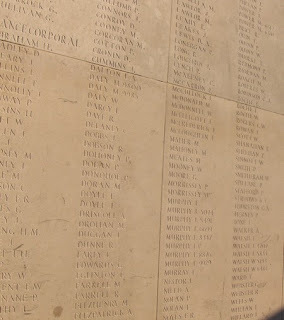 The 50,000+ names of those British (including Irish) soldiers whose bodies were never identified that are listed on the Menen Gate are overwhelming. Same goes for Thiepval. This is what we pay a license fee for? First of all, I cannot believe RTE is showing the Michael Jackson show. I mean, really, gimme a break. This is a total farce, but what's worse is that the whole thing is commercial free! What, they couldn't get Guinness or whatever to sponsor it? I bet they didn't even try. Well, if they have the money to burn on hours of revenue-losing nonsense then they should cut our license fee pronto. "It looked very nice." That's how Ireland looked to Ben Whitehurst from Texas as he was heading skyward after being denied entry to Ireland following his flight from America last week. Whitehurst was traveling with two other young guys and the three of them intended to backpack around Europe. The immigration authorities turned the three of them away, forcing them to spend $1,800 each on flights back to New York. When I read the story in the local Texas paper I had two thoughts: (1) these guys were pretty naive and (2) this is pretty much how I looked and acted when I was their age and setting off on my first visit to these shores. The law says that visitors must prove prove they can support themselves while they're here. Fair enough, but I can't see why the immigration people wouldn't accept an online bank statement if they would have accepted a printed one. There has to be more to this story. And, of course, these sorts of things are pretty darn common for young Irish travelers to America. So, it's not like the Irish authorities are unique in this. Wow! Aer Lingus is introducing a $100 charge for that second bag on your Transatlantic round trip flight. The Irish Times reported recently that women politicians want a quota system to ensure that a minimum number of Dáil deputies are women. Former Progressive Democrat TD Liz O'Donnell said that "without women in politics, our democracy was unfinished." Well, if women should be guaranteed a certain percentage of seats, what about other underrepresented sections of the population: people under 30; immigrants; people who haven't finished their Leaving Cert; people who are not teachers, lawyers, publicans; etc. And, the truth is, our democracy will surely be finished if we start adopting quotas in a bid to deny the electorate their democratic rights to vote for whomever they want. Just as many women as men are eligible to vote. Why don't these women ask why this fact alone doesn't guarantee 50% of the Dáil deputies are women? The NY Times says that British soccer fans are uneasy at the prospects of ESPN broadcasting English Premier League matches. Well, as a subscriber to ESPN's American sports network here (ESPNA), I'm concerned that they're going to add soccer to our prime-time schedule and ruin the American sports nature of the channel. I haven't heard if ESPN is going to launch a new channel on which to broadcast their soccer so I'm fearing the worst.